If you want more for your life, you are at the doorway of reinvention. In many ways, reinvention is giving up what you “should” do for what you know you were born to do. Yet too many women often try to fix something that is “broken” in their lives and call it “reinvention”. Reinvention is not about fixing and not about living a “should” life. It’s about living life with joy, passion and fulfillment. 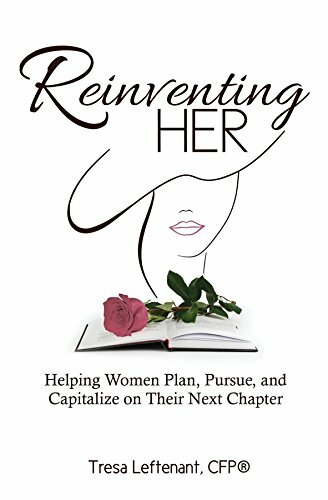 In Reinventing Her, Tresa Leftenant helps you unveil that “unlived life” inside you and encourages you to grow yourself big enough to allow yourself to receive everything you want in your life–the career of your dreams, the partner of a lifetime and the abundance we all deserve. If you’ve put Her–that beautiful essence of yourself–to the side on behalf of everyone else, its time to Reinvent You. It’s time you stepped through the doorway of Reinventing Her to the life you’ve always wanted.